Customize your product and category displays, swap themes, and update layouts using your Control Panel! Or you can easily customize the design of your store with HTML & CSS, since you’ll have full access to ProductCart’s code giving you no restrictions on how you want your store to look and operate. At ProductCart we're search engine ninjas and we build products that get you higher rankings. You get features like SEO friendly URLs, Automatically Generated XML Site Maps, Product Meta Tags, Product Alt Tags & Social tools, which means more sales for you. Mobile comes standard with us, it's a must in this day and time. On average, one in four, 25%, of your users will visit your store on a mobile device. ProductCart is built to give your users a great experience and a reason to come back. Choose from more than 30 payment gateways like PayPal, Authorize.net and Blue Pay. Giving you the flexibility to use what you want. ProductCart has advanced marketing tools such as customer reward points, online coupons, and gift certificates. Use these tools to build up customer loyalty and increase your online sales. ProductCart is a Quickbooks ready shopping cart. Having your shopping cart automatically synchronize with QuickBooks can really make the difference in your daily work routine. Built-in shipping integration with UPS, USPS, FedEx, and Canada Post. 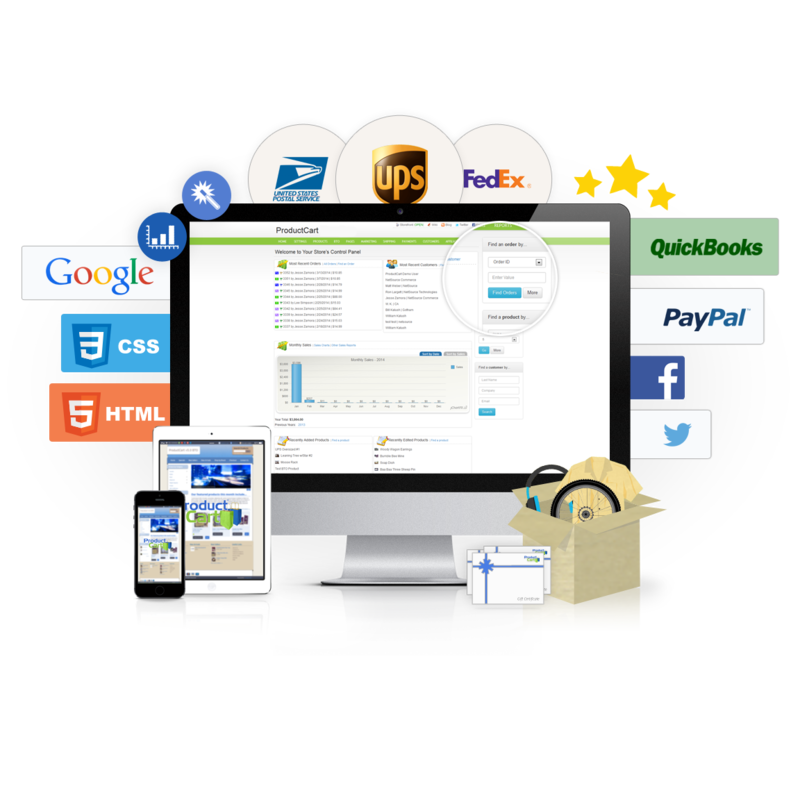 You will have tools like shipping calculators and the ability to print shipping labels. take our shopping cart for a spin.